A fuel rail pressure gauge reads your fuel pressure levels directly from the vehicle's common or fuelrail; this allows you to easily monitor pressure levels, which can let you know whether or not you need to change something simple like a fuel filter before you have to perform major maintenance. The gauge reads a diesel truck's level of fuel pressure directly from the fuel rail which gives you a simple way to keep an eye on your engine's fuel pressure level at all times, making sure that it stays within optimal levels. When the fuel rail pressure gauge finds pressure to be low, damage to fuel injectors and pumps can occur, resulting in a loss of horsepower. Too much pressure is also bad for the engine, forcing too much fuel through the injectors and resulting in a "rich" running engine. The symptoms of this can be very serious, ranging from fouled spark plugs, too slow or too fast idle, to even black acrid smoke which emanates from the tailpipe! Sometimes, low fuel pressure means that your fuel filter is clogged. Listen to the fuel pump, see if it's running, and take it in to a shop if it doesn't sound like it is. It's very important to monitor your fuel pressure, and fuel pressure gauges are the best way to ensure that you know what is going on with your system before it becomes a catastrophe. 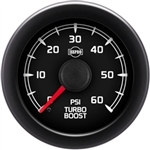 These gauges are made especially for engines with multi point fuel injection systems because they use a fuel rail to deliver fuel to each individual injector on the engine.